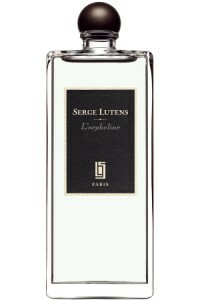 The other day I was trying hard to figure out why exactly I disliked Serge Lutens’s L’Orpheline as much as I did. Because I didn’t simply not care for it; it made me recoil and I had difficulty wearing it multiple times in order to review it. With some fragrances, you need a longer courtship to learn their moods and see how they can match yours, but in the case of L’Orpheline, I liked it less and less with each wear. On the face of it, L’Orpheline should be the right one for me. It’s an incense blend, and I love incense. It intriguingly promises to layer incense with cream, and I’m game for such surprises. It’s also the product of a collaboration between Serge Lutens and Christopher Sheldrake, and I have so many perfumes created by them in my wardrobe that I can be easily called a fan. So, why does L’Orpheline fail so dramatically to entice me? For one thing, from the moment I apply it, it reminds me of the smell inside a perfumery lab, where a variety of materials mix to a point that you don’t perceive them individually but as a fog of odor, dominated by something sharp and mineral. (It’s a marvel of the human nose that after a while you simply tune out this smell and don’t even notice it until someone draws your attention to it.) L’Orpheline, which starts on the cool, metallic notes of incense and aldehydes is too close to that smell, and since it doesn’t change much over its development, if you don’t like this kind of abstract, blurry effect, you’re out of luck. Secondly, the plastic-like drydown of L’Orpheline turns me off further. Once it settles down, I get the promised cream and softness, but again, I can’t shake off the artificial, cold sensation, and the combination of peppery, resinous incense with milky, musky notes makes me queasy. I imagine myself inside a brightly lit, modern art installation made out of brand new plastic that still reeks of the factory. On the plus side, L’Orpheline lasts really well, and despite its rich notes, it’s not at all heavy or dense. It can even be comforting, if you find the cool incense to be so, but you have to have more appetite for Serge Lutens doing odd things than I do. I will instead turn to my beloved but much neglected El Attarine, a woody violet topped with cumin. Unusual, intriguing, but still wearable. Of course, if you love L’Orpheline, please comment! Cornelia Blimber: I tested it briefly, did not like it and did not dislike it. On my skin, it vanished within half an hour. iodine: I tested it on a paper strip- didn’t allow it to touch my skin! I like it for the reasons you don’t, allow me to elaborate. The blurriness I find alluring. I also like the balance between dry smoke and the sweet creaminess. It might be worthwhile saying that I haven’t liked any Lutens ones so far and would say this is the least Lutens-esque in the range, more modern. The cold metallic quality offers a stark contrast to the body, I found it developed into this intriguing blend and throughout the wear would be pleased by the wafts. In the opening I got some mint and licorice but I may be imagining these notes. The varied reception of this fragrance is testament to how individual our tastes are! Umer: Victoria, I could not agree more. L’Orpheline is intended to invoke some kind of melancholia, but the truth is it does not evoke much of anything. This feels like a candidate for the L’Eau Serge Lutens line (where it might still be redundant). Annikky: I don’t mind Serge going for the cold (Iris Silver Mist, Un Lys, even Bas de Soie), but this doesn’t sound encouraging… Will give it a try, though, as with every Lutens. Gentiana: I just received a few days ago the sample of L’Orpheline, as I applied for it on the S.L. site. I had to fight with all my patience and power not to scrub it off, I kept it on my wrist for more hours, waiting some miracle will happen. I didn’t know how to describe the mixture of unpleasant odors and sensations – totally repelling for me. I would only add that in the head notes I felt a kind of cheap mens cologne undercurrent/ vibe. Flat and sharp. Maybe in the early drydown, somewhere after 2 hours of torture I felt an acceptable incense… otherwise… me too I felt like – Genial! Joy: This is a fragrance that I will not need to try. Victoria’s excellent description almost made me queasy. Aurora: After your description I certainly won’t try it in a hurry: ‘synthetic modern art exhibition made of brand new plastic’ non merci Monsieur Lutens. Victoria: They’re very conceptual and sometimes convoluted. Same goes for the press releases. I suppose, it’s curious on one level, but it just makes me shrug my shoulders. Rose: I agree it’s somehow inhuman, like something hyper new and remote, it doesn’t blend with natural smells and I winder if there’s a particular musk in this I don’t like. But if Lutens wanted to evoke a sense of disconnectedness then I suppose it works. He gets away with these experiments because his (or Sheldrake’s) palette is so diverse. Joy: I do love Gris Clair and some days can’t get enough of it. It doesn’t seem metallic to me just fresh and green. Amer: Ask and thou shall receive! The sample arrived in the mail today. I’ve only had a few hours or wear but I can say this: l’orpheline unlike what the name would imply, is definitely the most masculine SL I have ever tried. Drydown is a bit one dimensional for my taste and again, an unfortunate connotation with fabric softener -but is this a hint of sandalwood and amber in the margins of musk I detect? Now, for all the negative traits I am not ready to write l’orpheline off. I think perhaps it is not the kind of perfume one needs to stick his nose into and analyse to enjoy. It might simply work as a clean (and I mean squeaky clean) aura. Lasting power is very good -if a bit too good for my tastes. Cornelia Blimber: Yes, a very accurate description, will keep it in mind while testing. I did not dislike L’Orphéline, just found it not very interesting and having not enough longevity. I like vaporub, so maybe this perfume is good for me! Victoria: Yes, it lasts through a shower on me. Amazing! Cornelia Blimber: Amazing, yes, usually perfumes last long on my skin. I certainly must try it again. Of course perfume is only meaningful on skin, but should meaningful be the same as beautiful, or pretty? Maybe, when experimenting perfumers or other artists take new esthetics, our perceptions do change with the time. Once upon a time No.5 was daring, revolutionnary, ”abstract”–and nowadays it is called conventional or even ”old ladies perfume” by many people. crikey: I’m really enjoying this one. I went to test it at lunchtime the day it came out, and bought the bottle in the evening. I’ve not regretted that at all. It’s remarkably different on me on a cold day, and a warmer, more humid one. I wish it had more power to it, but it’s got a quiet persistence to it, and enough sillage to wrap tendrils round me even if they don’t reach far beyond. It shifts and changes almost constantly on me, never going icy. (I can’t deal with ISM–as I’ve mentioned elsewhere that feels like iced silver skewers being hammered into my sinuses.) Cool, yes, but not cold. It’s the cool of stone in a dark room, but a room where I’m wrapped in a soft scarf so any chill is a distant pleasure, countered by the balance of buttered incense.